Jonstraveladventures: Takoyaki with Galician pulpo, a first? Yesterday we had a seminar from a Japanese researcher who is currently doing a postdoc in Chile. After the seminar a few of us headed for dinner to a local restaurant and had the usual, very tasty selection of Galician delights, Pimientos de Padron, Pulpo a la feira, xoubas and much besides. I chatted with the speaker and his wife, also from Japan and when I mentioned that I'd inherited a Takoyaki pan from a Japanese friend who had left Santiago a couple of months back, their eyes lit up and they told me that it had been many moons since they'd had takoyaki. So, I invited them for lunch today for a hands-on takoyaki fest. This was the first time I'd made it, but in fact it turned out rather well and I'm sure to do it again soon. So, this is my/our recipe for takoyaki. Start off by making a dashi, a Japanese stock, which traditionally isn't as strong as a western stock. Before my guests turned up I made a shiitake stock by steeping a handfull of dried shiitake mushrooms in boiled water. This takes just 20 minutes or so. When they arrived, the stock was ready and to the dashi (around 275 ml) we added 200 grams of flour, one egg, a pinch of salt, a quarter of a teaspoon of baking powder, a finely chopped spring onion, and a couple of finely chopped shiitakes, previously well soaked. Take your takoyaki pan, should you be lucky enough to have one (see below), or equivalent and heat it directly over a flame until it becomes very hot. 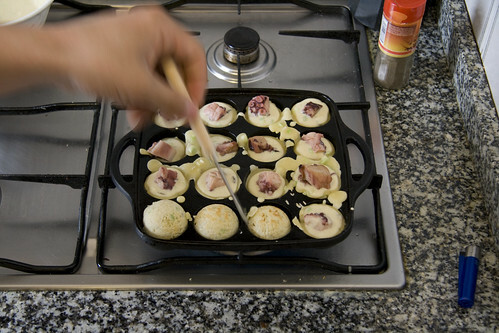 A good takoyaki pan should be as heavy as possible in order to distribute the heat slowly and evenly. Coat the pits in a little oil and spoon in the batter. This should sizzle straight away and start to rise a little. Immediately add a small piece of cooked octopus to each batter section. After a minute or so, take your takoyaki pick and turn the batter and octopus upside down. The bottom of each one should now be spherical. Cook for another minute or so and then put straight on a plate. For the sauce, mix a few teaspoons of Worcestershire sauce to a few tablespoons of mayonnaise and a dash of soy sauce (really one should get hold of an okonomiyaki sauce, but this is rather hard to come by in my neck of the woods) and spoon it over the takoyaki. Sprinkle the top with dried tuna flakes and enjoy, piping hot! Though my guests admitted that they weren't exactly as in Japan, they said this was mostly due to the sauce not being quite the same, but they seemed to enjoy them as much as I did, and I'll be sure to make them again. I'm sure that you could do the same thing with any normal cup cake tin, though you'd have to be careful with the quantity of mix and the temperature distribution, but it's worth giving it a go.